Allows Multi-Max accessories (excluding multi-flex) to fit all current oscillating tools from Fein, Rockwell, Bosch, Craftsman, Rigid and more. 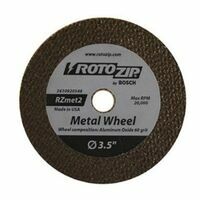 RotoZip Cut-Off Wheel, 3-1/2 in Diameter, Black, Applicable Materials: Metals Including Sheet, Copper, Brass and Aluminum, Includes: (1) Wheel Sand paper accessory allows the Multi-Max to be used for sanding hardwood, softwood, chipboard, rusted metal, fiberglass and plastics. Includes two per pack of 60, 120 and 240 grit. Requires MM11 Hook and Loop pad accessory (784.7205). Use with 122.5929. Adaptor for Rockwell SoniCrafter Hex interface model. The sandpaper attaches to the hook and loop sanding pad. Use to remove excess wood, finish and paint for faster surface removal in smaller areas. The holes in the paper allow for dust collection through the pad, resulting in cleaner and faster detailed sanding. The sandpaper attaches to the hook and loop sanding pad. Use to remove excess wood, finish and paint for faster surface removal in smaller areas. The holes in the paper allow for dust collection through the pad, resulting in cleaner and faster detailed sanding. Sand paper accessory allows the Multi-Max to sand paint, varnish, filling compound on a variety of surfaces. Includes two each of 80, 120 and 240 grit. Requires MM11 Hook and Loop pad accessory (784.7205). Use with 122.5929. Constructed from high speed steel with a cutting depth 1", used for window and door cutouts, Constructed from carbide with a cutting depth of 1", used to cut ceramic tile, cement board, stucco, and plaster. Adapts Universal Fit accessories to fit onto prior model Sonicrafter tool with hex interface. Universal fit system allow accessory to fit all major brand oscillating tools. 12 hook and loop sanding triangles: (3) 60G, (3) 80G, (3) 120G and (3) 240G. For use with most detail sanders and all brands of Multi-Purpose oscillating tools. Replacement flange for the SoniCrafter tool. Includes: screw, flange and allen key. Abrasive material for high performance masonry cutting applications. Cuts a wide range of masonry materials including stone, slate, cement board, bricks, concrete, cement backer board and more. 30 grit, silicon carbide grain. No need for excessive pressure, the tool does the work. Max rpm 20,000/min. Conversion kit allows you to change 1/4" collets to accept 1/8" bits on RotoZip tools. Includes: adapter, hex wrench, guidepoint bit and sabrecut bit. Constructed from high speed steel with a shank of 1/8", cuts all types of wood, wood composites, fiberglass, solid surface materials, vinyl and aluminum siding, plastic and laminates. For removing old vinyl, wood or other floor coverings, paint and coatings, residues and separating laminated layers and cuts carpets. Universal fit system allow accessory to fit all major brand oscillating tools. For removing elastic sealants, paint adhesive residues, wallpaper, worn gaskets, etc. Cuts carpet, leather, linoleum and similar materials. Universal fit system allow accessory to fit all major brand oscillating tools. Aggressive flush cuts and plunge cuts in wood, plastic, drywall and other soft materials up to 1-9/16" deep. Beveled tooth design for maximum blade durability and versatility. Special design creates cleaner, more accurate flush cuts. For use with all brands of Multi-purpose oscillating tools. Rigid scraper blade for removal of vinyl flooring, bonded carpeting, old coats of varnish/paint and adhesives. Flexible scraper blade for removal of caulk, coats of peeling paint and soft adhesives. For use with all brands of multi-purpose oscillating tools. High-carbon steel cutting edge for general purpose wood cutting applications. Curved Tec blade design for greater control and smooth, precise plunge cuts. Color coded interface and laser etched blade to quickly identify the right blade. Starlock interface for professional performance, also works with OIS compatible tools including Bosch, Fein, Milwaukee, Makita, Rigid and others. Precision Swiss made blade for accuracy and long life. Carbide tipped razor sharp cutting edges are diamond honed for satin smooth cuts. Slotting cutter arbors will work with any slotting cutter with a 5/16" arbor. Use on hand held and table mounted portable routers. For general purpose plunge cutting up to 1-5/8" depth in non-metal materials like wood, plastic and drywall. Universal fit system allow accessory to fit all major brand oscillating tools. Blade width - 1-3/8". For general purpose plunge cutting up to 1-5/8" depth in non-metal materials like wood, plastic and drywall. Universal fit system allow accessory to fit all major brand oscillating tools. Slotting cutter arbors will work with any slotting cutter with a 5/16" arbor. Use on hand held and table mounted portable routers. For removal of stubborn caulk, paint, adhesive residue, tile adhesive and window putty. For plunge cuts and flush cuts in wood, plastic, drywall and other soft materials up to 1-9/16" deep. Use with all brands of multi-purpose oscillating tools.